Glass half-empty, half-full or spilled all down your shirt? Have you ever been looking for a certain type of car and from then on you see them everywhere? Did everyone suddenly buy one because they heard you wanted one? Maybe, you rockstar trendsetter you! But more likely your ‘filter’ for seeing this type of car changed. Our senses take in millions of bits of information every day and only a very small portion of it gets the attention of our conscious mind – the rest gets filed by our sub-conscious. We adjust and refocus our filters constantly to make meaning of our lives. Humans are hardwired to make meaning of big stuff, little stuff and all the stuff in between. Different people can make a virtually endless list of different meanings from a single event – a high-five to freewill! Depends on our age, personality, upbringing, mood, energy, environment, what happened just before, what needs to happen after this event…the list goes on and on and on like your granddad talking about the good ol’ days. I love freewill – it’s a bit like a mobile phone on public transport – you love using yours but it drives you bonkers when others use theirs! Freewill made me do it! Because our conscious mind doesn’t want us to freak out and spiral into overload it stores pre-programmed meanings for us to grab at a moment’s notice based on how we have previously felt about similar events – this is just a waffly definition of ‘experience’. Thanks conscious mind for helping my head not explode with information overload (that would be so messy), but what if I wanted to feel differently about something this time? It’s kinda like going to a restaurant and there is only one thing on the menu – emm, I wanna be able to choose. Especially when the meaning I have made of an experience in the past led me to feel pretty crappy about it. Take a situation I had recently. I rocked up somewhere where I knew all the people pretty well – all good so far for someone who has their slider sitting 2/3’s towards the introvert end of the continuum. But this day one person looked like a bulldog chewing a wasp and snapped at me when I offered to help with a mundane task. I could feel my stomach churn and my heart race as I scrambled frantically to pin down what I had done, hadn’t done, had said, hadn’t said that could make them so hostile – this was my habitual filter kicking in ie. ‘someone is hostile = I have done something to upset them’. BUT, this day I had had enough sleep, breakfast, hugs (you just fill in the list for what makes you resilient) and I was able to tie a knot in my emotional unravel and keep calm and friendly. Yahh me! 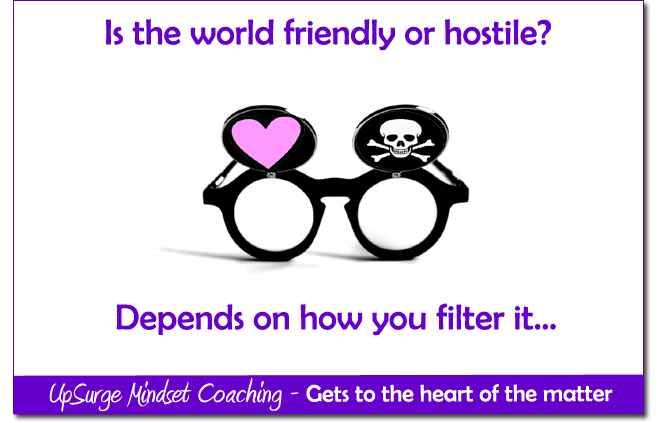 So in this case I changed the filter through which I interpreted this situation to ‘someone is hostile = they are upset and if it has anything to do with me I trust they will share their feelings with me if they need to’ (not a very snappy alternative meaning but you get the idea I am sure). Next stop on our fantastic filter fun-ride is a funky little phrase called ‘self-fulfilling prophecy’. Wikipedia says “a self-fulfilling prophecy is a prediction that directly or indirectly causes itself to become true, by the very terms of the prophecy itself, due to positive feedback between belief and behaviour”. In ‘people who don’t have a long list of letters after their name speak’ it means we decide what things mean and then filter the evidence to make it true. Think of it as a smorgasbord of meaning – we pile our plate high with the things that fit with our world view; completely ignore the things that don’t fit at all and for the meanings that partially conflict we pour so much tomato sauce (aka spin doctoring) on them that we can make them familiar enough to stomach. Another way of getting to grips with the concept of a self-fulfilling prophecy is Anais Nin’s delicious quote “We don’t see the world as it is, we see the world as we are”. All very interesting I might hear you say but why is this relevant? Well, my fellow filtering friend it’s relevant because we create, uncreate and recreate meanings for our experiences depending on our relationship with ourselves, others and the world at large. So, why not reframe a difficult event as an opportunity to grow and learn more about yourself rather than ‘the worst day of my life’. What I really invite you to put in your doggy bag from this post is that you get to choose the meaning. It can come down to viewing life through the filter of fear or love. Do you believe the universe is a friendly place that has your best interests at heart or a hostile place that has it in for you? There are so many ways of saying this that it could become a cheese-fest of synonyms so I will restrain myself and slip only one more in. Do you assume the best or the worst? Let’s build our meaning making muscles – how many meanings can we come up with for a traffic jam? Try reading an ‘assume the worst’ and an ‘assume the best’ meaning, pausing to notice how your body feels with each one. One single traffic jam can have so many meanings – why not choose one that makes you feel calm and living in a world that has your best interests at heart. If this gave you a laugh or a ‘yep, I do that’ moment please share it with your friends – they might need to build their meaning making muscles too.